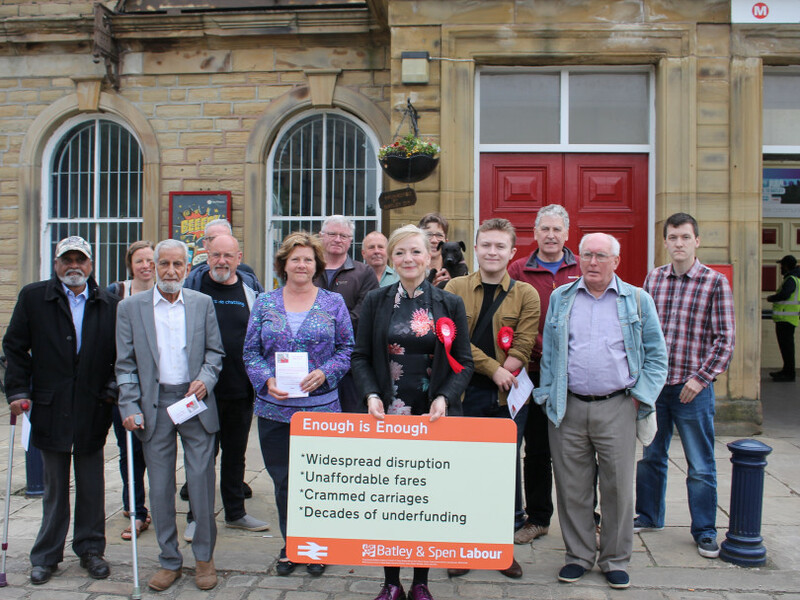 BATLEY & Spen MP Tracy Brabin organised a protest at Batley Railway Station on Friday morning following weeks of chaos on the district’s railways. North Kirklees commuters have been forced to travel on overcrowded and late-running trains after a new timetable was introduced by train operators. Travel woes worsened this week when Northern introduced an emergency timetable, which removed 165 trains from its schedule. Dewsbury station has also been badly affected, with changes to services meaning commuters travelling from Manchester have been forced to go on to Leeds in order to get a connection back to Dewsbury. Now Ms Brabin is cranking up the pressure on “weak” Transport Secretary Chris Grayling by holding a protest at Batley station. The station is operated by Northern but no longer has any Northern services stopping there. After challenging the Secretary of State in the House of Commons over the chaos that travellers are experiencing Ms Brabin said: “The whole franchising system is in complete chaos and I have to say, Chris Grayling in the chamber was definitely a man under pressure. “The fact that he is blaming the companies is so weak. In my old job as an actor if the show was rubbish the director got the sack. “This system has proved to be rubbish so somebody has to take responsibility. “It is deeply worrying and dangerous, and also families who are on zero-hour contracts are scared of losing their jobs because they’re continuing to be late for work. Both Ms Brabin and Dewsbury MP Paula Sherriff said dozens of constituents have complained. Over the last fortnight, owing to a knock-on effect from Northern Rail delays, TransPennine Express have struggled to meet 40 per cent punctuality through Dewsbury. Mr Grayling has promised that Northern passengers will get compensation – but no package has yet been arranged for TransPennine customers. Northern also announced an interim emergency timetable with 165 services a day removed from the schedule until July 29 to deal with the impact of earlier timetable revisions. Miss Sherriff said: “What a mess. On Mr Grayling’s watch we’ve seen plans downgraded for an East-West Crossrail for the north and now a botched new timetable causing despair for the region. Ms Brabin added: “Enough is enough – that’s the message we need to send to the government. “We are fed up of being bottom of the pile when it comes to transport investment and we are sick and tired of paying through the nose for an over-priced, unreliable and overcrowded service. “It’s simply not good enough and something has to change."